A few years ago Paula, in our local quilt group, finished her Grandmother's Flower Garden quilt. It is beautiful. She told me it took something like 10 years go complete from start to finish. And that includes hand quilting. It is truly a work of art. 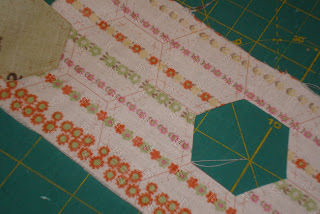 I was so inspired by the beauty of hexagons (as is every quilter) that I vowed to learn. Well time flies. This year my daughter Natalie decided she was going to start a hexagon quilt. Ambitious to say the least. 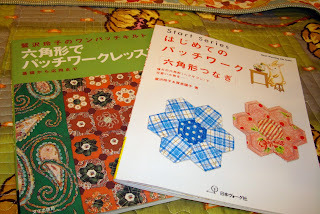 So I ordered these 2 Japanese quilting books on hexagons as inspiration books for both of us. The book on the right is a beginner book with simple projects and the one on the left has crazy lovely amazing things in it. Both are great books. The books are full of lovely photography of projects and how to (in Japanese of course) but the pictures seem clear enough to follow. I decided I could probably make something this simple. And although I have no plans now for a Grandmother's Flower garden, there is no reason I shouldn't learn and applique some pretty flowers like these. I've been pouring over the beginning book gaining confidence. Somewhat. This is from the other book, obviously. Not a project for a beginner. This one is so beautiful. Even the paisley is appliqued! Yes, I said appliqued paisley. (get that Terri). Here is a Grandmother's Flower Garden varation. See someof the book is in English. But not much. I love this one. The dark green sets the flower garden hexes off so well. It is just so pretty. 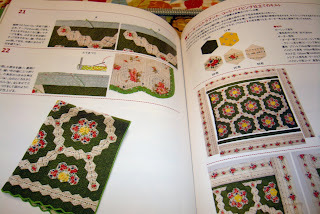 Since getting the books and dreaming about making such a complex hand pieced quilt, I've payed special attention to Cathi's blog Quilt Obsession. 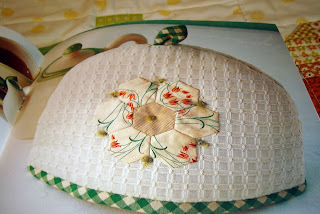 If you haven't visted Cathi's blog - go see what she has done with hexagons. Cathi introducted me to Inklingo. Without really getting into the details. Inklingo is a program where you print the hexagons right on the back of fabric and hand stitch them together with no templates and no basting. You really need to go through Cathi's posts to get the idea. Even though we all know I have many projects in the mix. I decided to start on some hexagons for hand work when I'm not in my sewing room. You can see above the printed lines on the back of my fabric. This template above is for cutting out with scissors. The program also has diagrams for rotary cutting but I was going mobile with it so I printed the scissor cut variety. Here is my first flower! My hand stitching could be better. (lots) But it was really fun and no templates! Really go to Cathi's to see the back (hers is much neater than mine) and get more details. 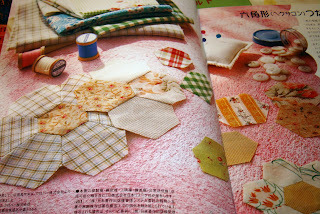 Hey, now I might even be able to make some of those lovely projects in my Japanese quilting books! A Grandmother's Flower Garden quilt is still eons away. But it is now more of a possibility. 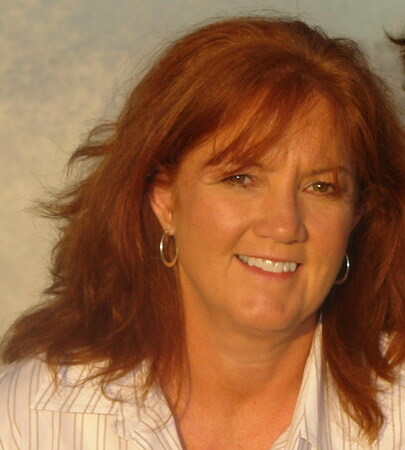 Thanks so much for all your help Cathi. and the grandmother's flowers quilt is on that list. i feel intimidated by it. i mean YEARS working on ONE quilt really makes me cringe!!! lol. i'll check out cathy's blog. looks good to me! i would love to try this someday....that someday list is obscenely long. hexs are sooooooooooo addictive - I love them!!! Oh my.. I'll say you have been hexed! And now I bet your hooked as well. Really nice job you did on that green flower. It looks like a lot of time is involved.. but there are so many of these pretty hexagons popping up everywhere now.. makes it very tempting to try some! Great first flower. I love these quilts but I don't think I will be making one. I can admire though. Oh Nanette.....i would love to be hexed as well. i have 2 vintage hexagon flower garden quilts draped over chairs in my sewing room and i look and "study" them often....looks like you are off to a good start! hope you and hubby are all back on track this morning....let me know!! What fun books. I loved all the little projects. I might have to try a couple. Thanks for sharring. Sigh! I have a ton of GFG blocks ready but the 'path' between the blocks has me baffled. I've spend so much money on books and patterns and yet I can't figure out how to do it. I've done all of mine with English Paper Piecing and truly enjoyed the process (cuz I love handwork) but they sit and wait. Love grandmother's flower garden but I think I'll love the projects of others! Boy that darling tea cozy caught my eye. I see gorgeous projects in your future. I've been thinking about doing a hexagon quilt...I've seen so many beautiful ones on many different blogs. Like you said, you can take them with you to work on when you're out of the sewing room! 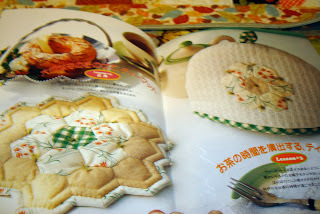 Love, love, love the Japanese books...where does one find out about these Japanese quilting books? I love what you have done! Hexagons seem so intimidating, I wish there was a great way to machine piece them. I am kind of like Mel Gibson in the movie Conspiracy Theory: Every time I find those little paper hexagons in a quilt shop, I have to buy some. 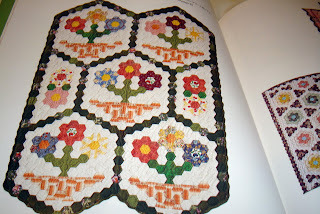 If you look at the header of my blog, that hexagon quilt was made for me by my Grandma. That was the only kind of quilt she made. Where did you order those Japanese books from? appliqued paisley? yummy!!!!! i love it...and am afraid after reading your post that i may be hexed, too! =) must check out inklingo and all that fun stuff! thanks! Thank you for posting everything about the hex! I am working on my own grandmother's flower garden and it will probably take me at least 10 years to make! I really need to get working on my GFG! Have you seen the fantastic ones at Material Obsession? OMG, they are incredible. I LOVE Grandmother's flower garden. I want to make one so bad. Erica at Polka Dot Quilts made a hexagon quilt on a sewing machine for her baby when she was born a few years go. I need to figure out how. Maybe if I start with a baby quilt I'd actually finish. I'm going to be teaching the traditional method of Grandmother's Flower Garden at Bryce. I love the Japanese versions. Would it be too much to ask to bring those books with you to Bryce? I'd love to look at them and show them to my class. Since they are Japanese I know I can't run out and pick them up. If you have too much to bring or think about, it's OK if you can't. You inspire me to no end Nanette!! Thank-you for taking the time to post about these books. I honestly never thought I would be interested in making an actual quilt but you must be rubbing off on me!! I love hexagons but sadly no patience. I can't wait to go to that link and check it out! Hexegons are wonderful. They are on my "to do" list. Oh how fun Nanette! I can't wait to see what cute stuff you make with those--I know I will love them :) I saw someone at Quilt Festival demonstrating some quick easy method of making hexagons, unfortunately I didn't really pay attention because I know I would get to about 3 and quit lol!!! Wow, Nanette -- you're really off to the races. Isn't it easy printing them? :-) That second hexagon book looks interesting. And, really, the projects in the other one are not that difficult -- it's just a matter of joining one hexagon to another over and over. Those Japanese books are awesome. I have a hexagon quilt that I started several years ago. I need to get it out and start working on it again. So many beautiful things to make. You lucky lady! I adore hexagons and Japanese books too! What a lovely two books and thank you so very much for sharing! that magazine is lovely. I always want to get them but they are so costly. I use the mylar templates and so far they work great. If you email me I will send u pictures of what I have made. Oh you will LOVE making those hexagons, dear! 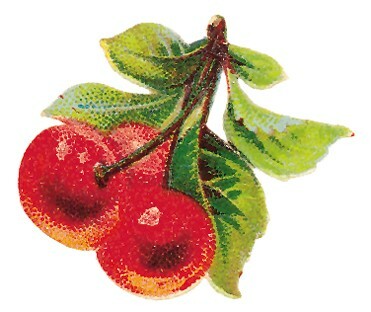 (beware : they're VERY addictive, HeeHee...). THANKS for showing those books, I'm going to try finding them on the web (can't pass any hex's book). Actually, I made a Grandmother Flower Garden (single bed size - with the English paper piecing method)with my dear grandmother's coton aprons. Each flower being on a GREEN hex's bed, as you mention (what a coincidence!). 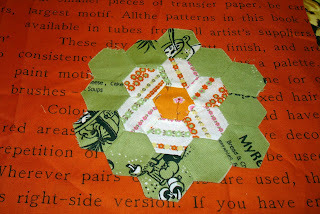 It was all handpieced and I handquilted each hexagon. It took me 4 years to complete it, and I'd gladly start a new one, any time. Just LOVE that endless possibilities, and so relaxing pattern. That is so funny that I strolled across this post today as it was just last night that I was thinking how much I would love to do a hexagon quilt!! 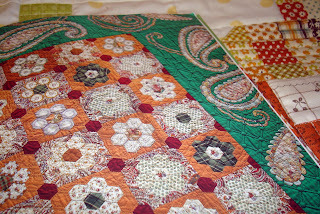 I think it is something that I am going to tackle with my scraps now that the scrappy cabin quilt is finished. I am all for a long term "stitch when you can" quilt project. Love the books and your first flower looks great!! 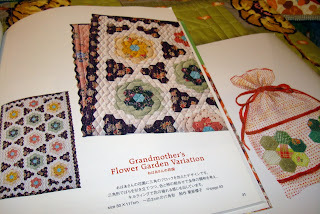 Just went to look after that beautiful Japanese hex's quilts book, (I mean the green one, on the left).... boooohooohooo, couldn't find it right now. Could you pleazzzzze, Nanette, email me the references, and tell me where your ordered it from ?? Wow -- that looks like a really different way to piece those hexagons! I've always wanted to make a GFG but the two people I know making them have been working on them for over 10 years so I've been scared off! Love your cottages too - they are so cute! My husband went on an LDS mission to Japan. Too bad you can't borrow him to help you with that book. This is wonderful...I have been intimidated by hexagons, so I wish you well and maybe you will inspire some of us! I have a GFG quilt my Grandma made, love those hexes. :) I think it's great you are taking on this task and your first block looks great. 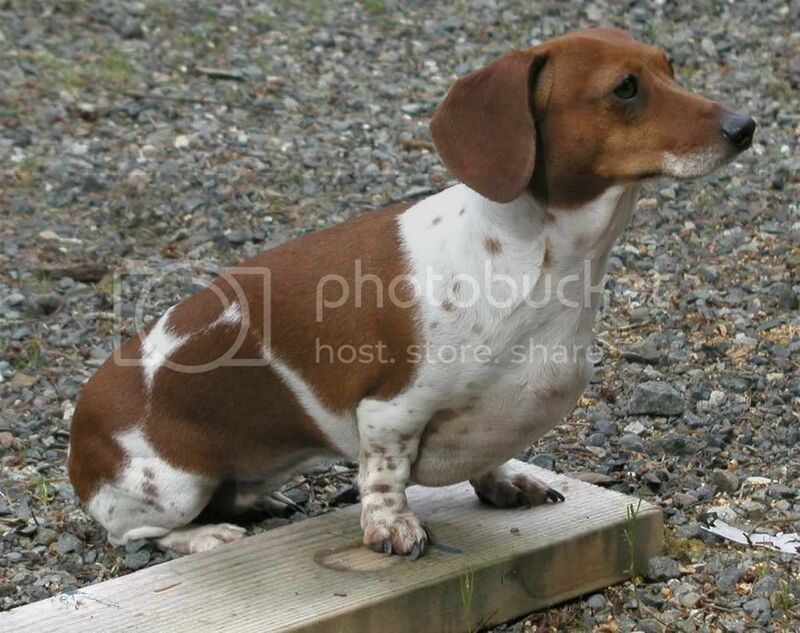 I think it's more than I could tackle right now even despite my short attention span & little patience! :) You Go Girl! I do believe you've "hexed" me now, Nanette! My goodness, what a gorgeous bunch of quilts and quilty things. Your flower is adorable - I think you did a very nice job. Thank you for the links, too. Such inspiration! What is it about those hexagon quilts. I love them as well and this sounds like a great way to try. I'm going to go check out that blog and read some more. Thanks for the link. thankfully I haven't been bit by the hexagon bug yet. I couldn't afford the time with all the projects I've got going right now. those books and the projects are lovely, though. Hello, I was wondering if I could get a title for this book. I saw it on Ebay years ago, and should have bought it then, but didn't. I have a few pictures from it downloaded on my computer, but would like more, if not a copy of the book itself. I also have tried to find a copy of this book or its title. You wouldn't happen to be selling yours would you? Thanks!